If you fancy getting dressed up to the nines and meeting some of the locals, then our Dinner Dance is the place to come. Bring your own refreshments and come and join us on Friday evening at our local School hall. But book soon as this is always a highlight in the Napier social calendar! Tickets are R80 per person. Contact Jeanine Fourie for tickets. Email: plattelandsemooi@gmail.com, phone: 076 518 3040. 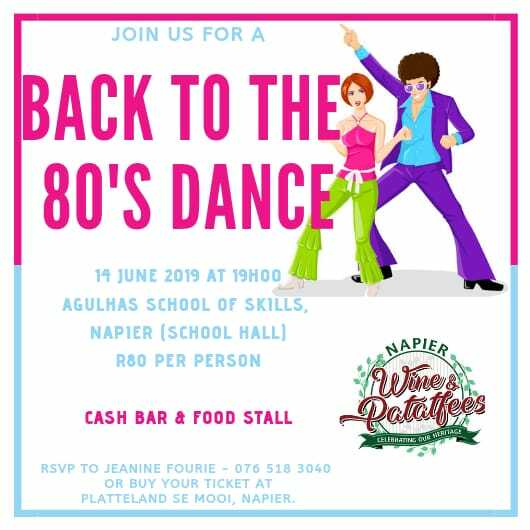 Tickets are also available at Platteland se Mooi, Napier.